A cold winter day in 1930. 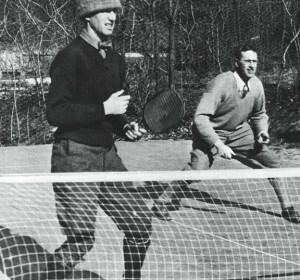 Earle Gatchell (left) and Fessenden S. Blanchard on the first platform tennis court. While deck tennis rings and badminton birds were easy to keep in bounds, paddle tennis balls were a challenge. To keep the balls from running down the surrounding landscape, the court needed back and side wiring. Before long two-inch mesh chicken wires were stapled to eight feet high upright two by fours that surrounded the court. Gradually the court was completely surrounded by wires. The screens rose to 12 feet by 1932 as play evolved. 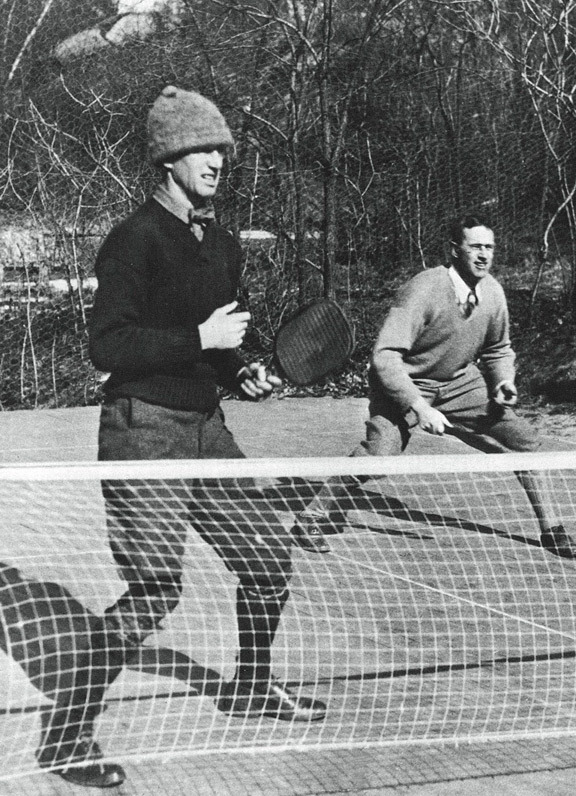 Blanchard and Cogswell soon decided that the badminton 44′ x 20′ measurements were much better than the 39′ x 18′ measurements used in the original form of paddle tennis. By using the outer lines of badminton doubles, only two feet separated each back line and the chicken wire. This didn’t give them enough room to swing their paddles. This led to the decision, which in the opinion of all present-day players, has “made the game.” They decided to allow players to take the ball off the back or side wiring: that is, as it bounced off the wire after having first hit inside the proper court, and before it had hit the platform a second time. If the landscape had allowed the court to be lengthened, it would never have been discovered how much this new rule added to the fun of the game. The rule prolonged rallies and took the advantage away from the net players. Irregular bounces and balls sticking in the mesh plagued the early days. Reducing the mesh size to one-inch solved the ball sticking problem but eliminating irregular bounces had to wait until the development of the Evans backstop in 1934-35. Note 1: Some secondary sources cite the following incident recounted in Blanchard’s book Platform Paddle Tennis as the beginnings of what was called the “ground rule”. “And sometimes the balls stuck in the two-inch mesh, which we used at first. I remember once when that happened on our side of the net I ran around behind the back net and gave the ball a hefty swat. To everyone’s surprise it went over the net into the other court. My partner kept the ball in play until I got back and we finally won the point.”. This is incorrect as both Blanchard books explicitly state that the “ground rule” was adopted at the very beginning. He called this Lucky Incident Number 2. Lucky Incident Number 1 was the decision on the court sized based on the geographical constraints. Note 2: At a presentation to Fox Meadow members in March of 1997, Molly Ware, Blanchard’s daughter, confirmed the apocryphal nature of the story. “As has often been reported, it is not true that my father dashed around the back and whacked a bail that was stuck in the screen across the net, shouting, ‘it’s in play.’ A terrific story, but sheer fiction.” She explained that the insufficient area from the baseline to the screen did not allow for a full back swing and created a condition where play off the screens became a necessity.